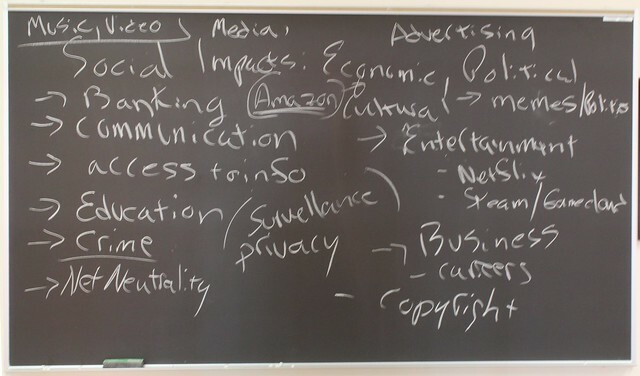 The Internet Course summer edition has officially started, and today we brainstormed some research approaches to the four major topics we’ll be designing the course around over the next five weeks. 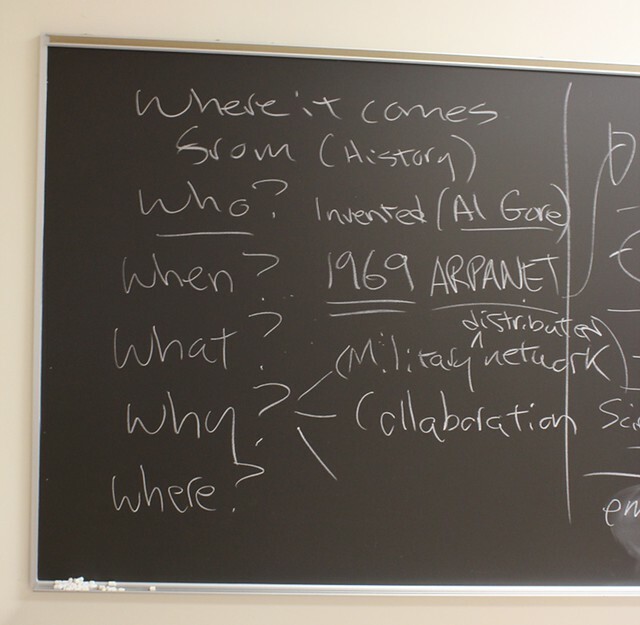 Below is a record of that process, and it’s interesting to see the similarities and differences with the spring semester’s brainstorming session back in January. During tomorrow’s class we’ll discuss the CRAAP Test video, as well as get an overview of researching in UMW’s library. After that they’ll immediately be set loose on the library given they only have two days to find three relevant articles for each of the four topics (twelve in all). The life of an internaut is INTENSE! Once they’ve done their research, students submit their findings to an online form. The articles/books are then vetted by Paul and I based on the CRAAP test (using the red, yellow, green light method described here). An important note here is that there can’t be any redundancy, if two students find the same article or book the first to submit it gets credit and they other has to go fish. This is possible because the form is public and they can see everyone else’s submissions. At least half of the 12 articles/books they find have to be green, which means the meet all of the elements of the CRAAP test. The other half have to at least be yellow, which means there are a few elements in question. Nothing red counts towards the twelve articles they need to find. And with that the course begins to take shape based on what they discover. Hopefully as much of this process is driven by interest and curiosity as expediency and getting it done. This topic quickly becomes the Who, What, When Where, and Why of the internet. Al Gore can’t be underestimated in this process, and it’s interesting that this was the same approach taken to this topic by the class during the Spring semester. What quickly becomes apparent with this topic is that so many of these details are negotiable. Did the internet start in 1969? Was it earlier, say 1959? or even 1945? Obviously there are hard and fast facts, but the nexus of relationships and events makes the history far richer than the standard narrative. This topic was interesting because the first suggestions that came up was what the hell is binary? Which led to what is digital? I love that it started with these concepts, because in many ways they undergird the internet. 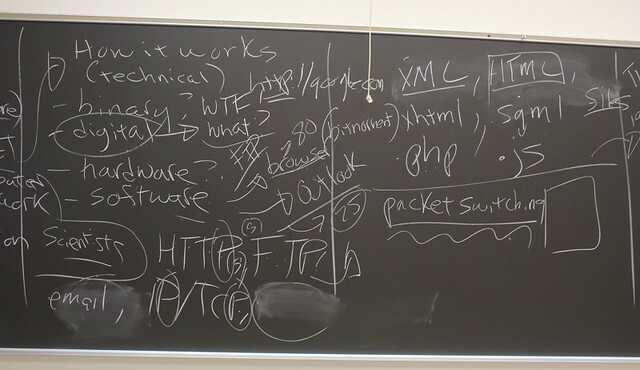 From there they suggested hardware, software, protocols, languages, and I threw in packet switching towards the end using bitTorrent as an example to try and explain how this means of networked communication works. A solid list to start thinking about research possibilities to find articles for this topic. It’s almost ridiculous to suggest we can cover the social impacts of the internet in a week, but faith springs eternal. And just from this cursory list it quickly becomes apparent just how broad and deep the impact is across all domains. I’m hoping as we work up to this topic we can identify a way that pulls from numerous examples to try and communicate these impacts. It will be fun to see how the project for this week attempts to communicate this, should be fun to watch that unfold. The final topic is the future of the internet, and interestingly enough much of our future framed here is the present. 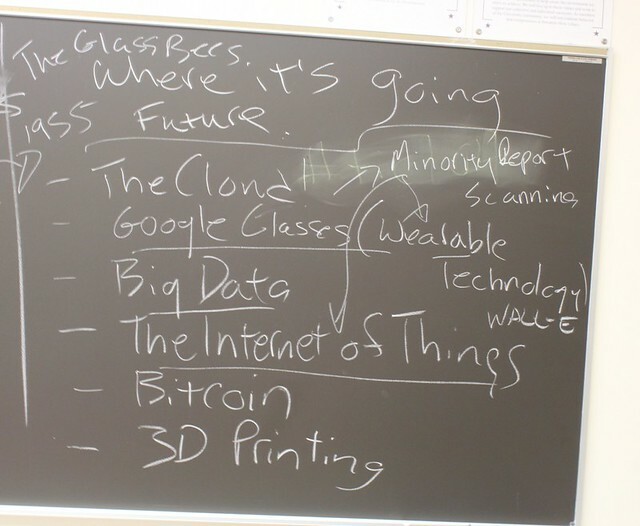 From cloud computing to Google Glass (wearable tech) to Big Data to 3D Printing to the Internet of Things—the future is now. It can be hard to think outside the present, so this topic is an interesting thought experiment, and hopefully we’ll push hard on whether the internet will even be recognizable as such in the not so near future. This entry was posted in The Internet Course and tagged craap, library, research, tic104. Bookmark the permalink.